My morning shower routine is where I basically get as much done as possible, spending 15 to 20 minutes might seem like a long time but I cut down so much time buy getting everything done in one place, from bodycare to skincare. It is handy that over the summer, I have got into this routine as when I start univeristy, it will cut down so much time and hassle. The first part of my shower routine, that is more of a luxury rather than time cutter is the Ecocamel ORB Spa. It is a out of the ordinary shower head that allows you to have a shower and relax at the same time. This one in particular is the Vibra Soft and retails at £128, quite pricey but you are essentially getting three products for the price of one. 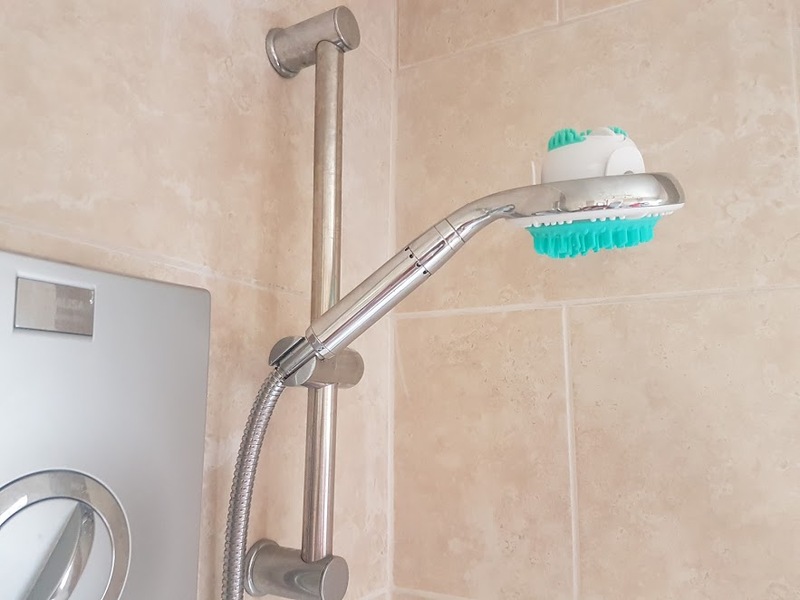 A fast and powerful shower head, which wakes you up in the morning, this is the white part surronding the blue. The blue part is where the shower head turns into something different, it is a handheld, battery operated massager. This can be used on the body and face, to help massage and deep clean the skin. I have been using this for a few weeks now and every morning, using the head I have been exfoliating my skin with the first setting. It has worked wonders on my elbows and knees, the two areas where dry skin is very stubborn. I love that you can easily remove the massager from the shower head, to use all over and then pop it straight back into place. Sometimes I have been using it dry and other times I have been applying a scrub first, The Body Shop French Grape Seed Scrub has been my go to recently, taking a small amount on my arms and legs, working it in with my hands and then following up with the massager - this leaves my skin feeling soft and really smooth. No one likes getting up in the morning, no matter how much of a morning person you are. 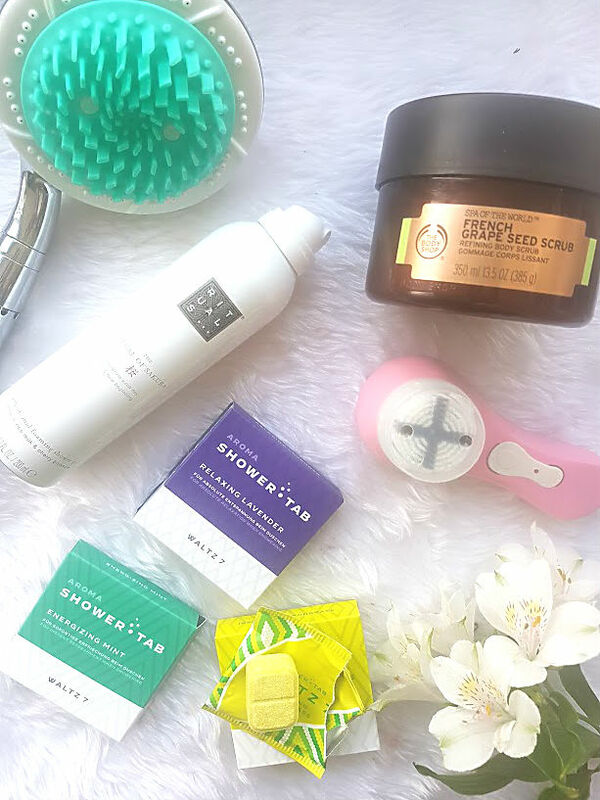 Going in the shower for me is the time where I am going to wake up properly, these products help to speed up that process - all whilst helping me smell nice! Before jumping in the shower, I place a Waltz 7 Tab in the bathtub, these almost dishwasher tablet like tabs release a crazy amount of fragrance into the air whilst you have your shower and has the whole bathroom smelling amazing. There are 3 different scents in the range and each one is perfect to use for different things. I love using the Mint one first thing in the morning as it is strong smelling to wake me up. The Lavender one is of course great when you want to relax, either on an evening or at the weekend and the Lemongrass one is a nice change comapred to the usual scents we go for in the bathroom. This one I find, spreads throughout the house and smells amazing - so fresh! I have loved using these tabs in the bathroom, all you have to do is place one on the floor before going in the shower and let it dissolve. The smell is instant and is a great pick me up. As far as in the shower is concered after the exfoiliating, I have been loving the Rituals, Ritual of Sakura foaming shower gel. I love when a soap foams up, makes it even more fun to use and you use less, meaning you don't run out as quick. This soap is very nourishing and moisturing, it leaves a very thin layer of something on the skin, this is enough for me to not then follow up with moisutriser afterwards. It is at this point that I also do my skincare, the Magnitone face brush is the perfect tool to use in the shower. 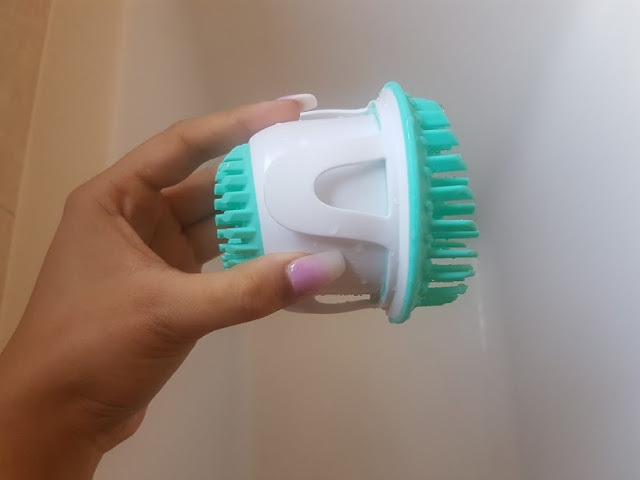 It helps to cleanse the skin as well as wake you up, I have been using a face scrub on the brush in the shower as it really gets into the skin. This gives me a nice canvas to apply makeup to later on, as my skin is smooth and ready to go. I have loved changing my shower routine up a little, to incorporate different products and ones that smell incredible. Let's just say there is no need for me to apply any perfume after all of these!